This copper rendition of a ginkgo branch and leaves will lend organic intrigue to your decor. 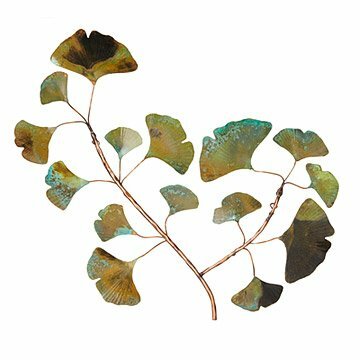 This stunning copper rendition of a ginkgo branch and its fan-shaped leaves will lend organic intrigue to your decor. Catherine Murphy's lustrous wall sculpture features a hand-painted patina, giving each one depth and detail. Includes hanging hardware. Handmade in Asheville, North Carolina. Great piece. It's very well made and the coloring is lovely. It's somewhat small so it does well in a spot that accommodates its size. The photo doesn't do it justice. I was worried it might look a bit dull, but the leaves have a beautiful glossy sheen that brings it to life. I actually bought it to spruce up my cubicle at work and I love it! Each stem has a loop in the back for hanging, so mounting it was easy. The copper is also flexible enough to adjust the leaf positions so they overlap here and there. Very happy with the purchase.